PACKAGE TERMS & CONDITIONS: It is our policy to present the cost of our holidays inclusive of all airport and government charges. Please accept however that these charges are not within our control, therefore we reserve the right to pass on any increase.. Travel agent professional service fees where charged, will be additional to the advertised prices. Valid for sales to 15 May 2019. Valid for travel commenced and completed within the period 19 Apr 2019 to 21 Oct 2019 (unless otherwise specified). *Subject to availability. A limited number of cabins are available per departure at discounted fare. Prices shown are based on per stateroom costs in New Zealand Dollars, for payment by cash, cheque or eftpos only. Credit card sales not permitted unless Travel Agent acts as a merchant. Confirmation of booking must be secured by a non-refundable cruise deposit of 10% due within 14 days of booking. The balance of the cruise must be paid no later than 60 days prior to sailing. Valid for new bookings only and not combinable with any other offer. Savings is included in fares shown, no further discount applies. Valid for twin/double share only (no further single cabin or child fare discounts apply). Valid on the 3 and 4 night departure dates as specified only. 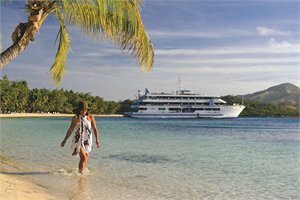 Orchid Deck cabin inclusions: Welcome fruit platter, complimentary daily stocked mini bar with beer, wine, soft drinks & bottled water, Nespresso coffee machine & tea selection, and Nama of Fiji gift pack. 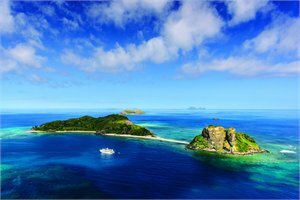 Cruise itineraries subject to wind, tide and weather conditions and are operated at the sole discretion of Blue Lagoon Cruises. Further conditions apply. Strict cancellation fees apply. For full terms and conditions and cancellation fees please contact your local travel agent for more information. Trade enquiries via GO Holidays. Prices are subject to change at any time without notice. Daily gratuities are not included and must be paid onboard at the conclusion of your cruise before disembarkation.